When life hands you lemons, make Limoncello. As a child I always longed for a secret, magical place for my lands of make believe. However, thirty or some years later, my adult practical side demanded more storage, an element quite lacking in our hundred year old house. Fortunately, my day-dreamy side won out with the conviction that a child is only a child once. Soon, way too soon, they will have moved on and then there will be plenty of room for storage. 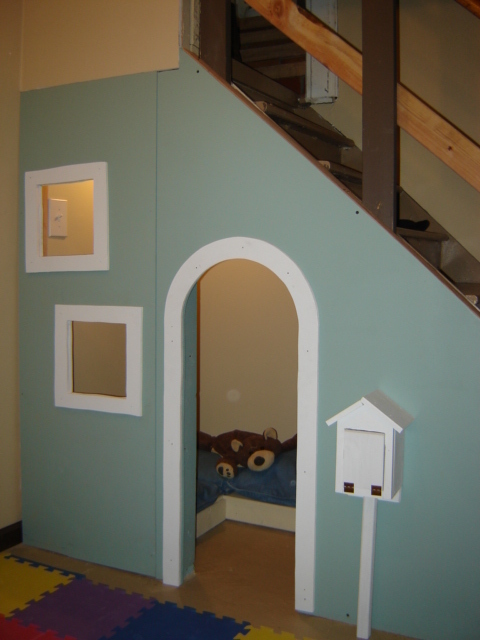 That conviction began the “Playhouse Under the Stairs” project or as the Home Depot guys called me, “You’re the Playhouse Stairs lady right?.” Many trips were made with Isaac to pick up boards and such on Tuesdays and Thursdays when Monica and Daniel were both at school. The guys at the Depot were really helpful. But I’m getting ahead of myself. Before buying the boards, I dived into the internet for some ideas and helpful hints. Medium density particular board was recommended. Different styles, different themes were shown. I opted with something simple: clean lines, minimal painting, recycling materials as much as possible from what was lying around the house like an over-abundance of couch cushions which I turned into padding for my little, “raised sectional” within the playhouse. A sectional for a playhouse? It still makes me smile to think of it. Why a raised sectional? Well, the floor of the playhouse is cold concrete. Definitely the stuff to wake any child out of a dream-like state once their little tootsies touched the ground. So, something had to be done about that and Greg was very handy and surprisingly open to my wild sectional idea. He made a raised platform in an L-shape by using two-by-fours and particular board so that the kids didn’t have to sit on the cold floor. 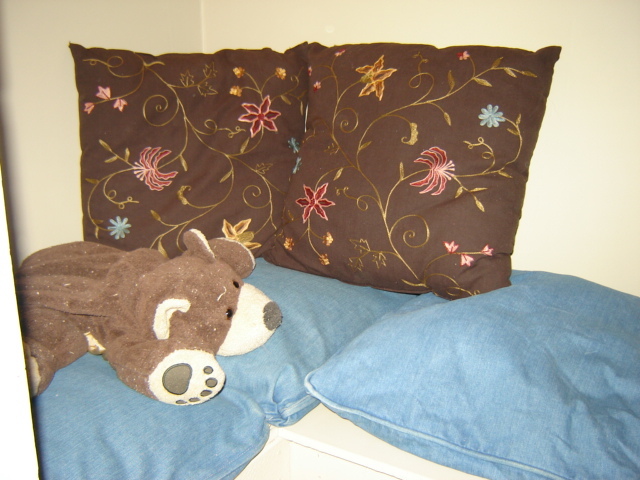 The pillows added a little comfy-coziness to the seating. I hope to cover over the pillows with something more whimsical, but one of these days if you know what I mean. 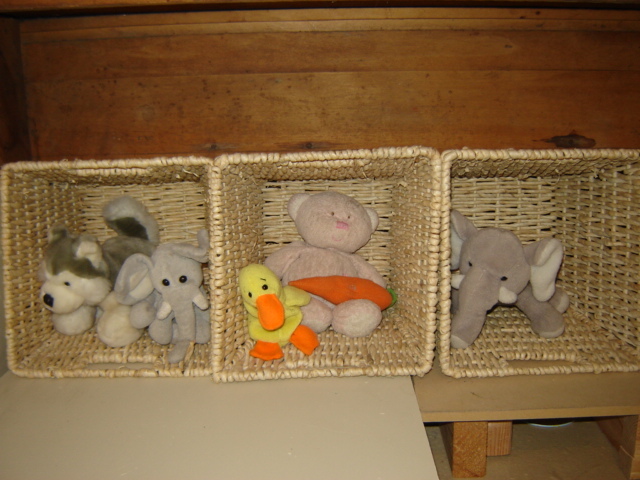 I was tickled pink to discover some unused wicker baskets fit perfectly in the low end of the stairs. Amazing, just the right size. Simply magical! They are perfect for storing trinkets and stuffed animals, wands and weapons. Last but not least, I added a little mailbox so that the kids could play “Postman”. 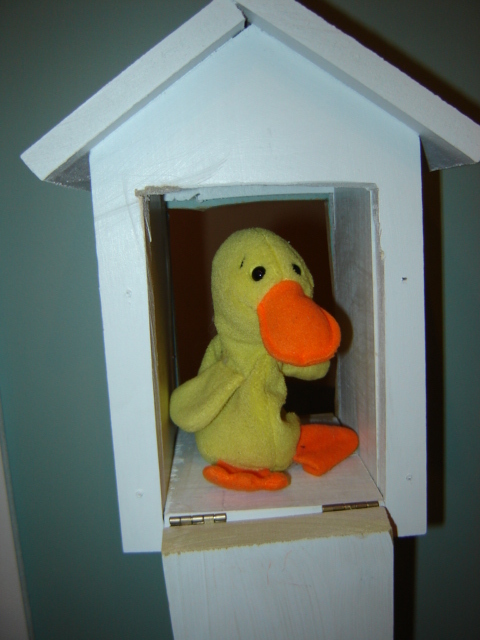 Deliverers can put the letters in the box, and the mailbox opens directly to the inside of the playhouse so that guests can get their mail without leaving the comfort of their tea and crumpets. The result was, if I don’t mind saying myself, charming. If I were to do it over again what would I change? My recommendation: use real molding. We tried to make our own using the jigsaw (as I wanted a rounded door) and unfortunately the jigsaw had way too much give. The result was wavy, uneven lines which drives me absolutely batty, but hey I must let go. The little house for children right! This entry was posted in Architecture, Parenting. Bookmark the permalink.